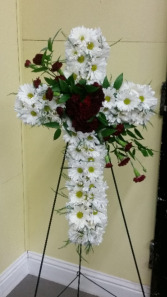 Fresh floral cross made of daisies and carnations at the $100.00 price. Other flowers may be specified at the higher price points. Shown is a 24" cross on a 54" easel.